When you finally have space for a spare room, it’s like a dream come true: at last there’s an area to turn into a luxury guest room, a designated crafts space, or perhaps a playroom for the kids. You likely didn’t plan for this longed-for space to become a junk room, but clutter builds seemingly in the bat of an eye, and in our busy lives it becomes another job to be fitted in ‘another time’. Taking the bull by its horns to remedy the situation is easier than it seems with a few choice tips. Check out our ideas on repurposing your junk room and you may just be inspired! Whilst a spare bed is great for overnight guests, the rest of the time its sizeable dimensions mean you make the most of the space by heaping junk on top of it…until the very existence of the pile becomes academic as nothing in the heap will ever be found again! A far better solution is to employ a fold-away bed. 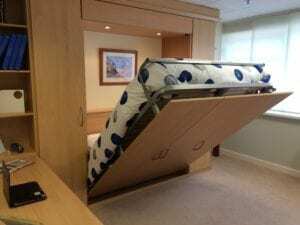 This could be a wall bed, designed exactly to fit your space, which can be stored vertically when not in use, or a sofa bed if perhaps you use the spare room for socialising or watching television. You’ll have a sleeping space for visitors when necessary, but can make use of the seating or spare floor space the rest of the time. You may have a desk that you use for the likes of work or crafts, but that becomes inaccessible due to piles of paperwork. This is where a fitted desk with wall storage comes in handy. You can organise everything effectively on its shelves, and have more room to move about and be more productive. For tighter spaces, fold-away wall desks may be a solution. As furniture is replaced over time, there’s a tendency to relegate old items to the spare room instead of getting rid of them – even if it’s an inconvenient shape. Whilst this is a sensible use of resources and saves extra expenditure, it will take up more space, and can even make the spare room inaccessible. Fitted furniture will solve the problem, seamlessly moulding to the shape of the room. Sell your second hand items for spare cash, and invest in something better! 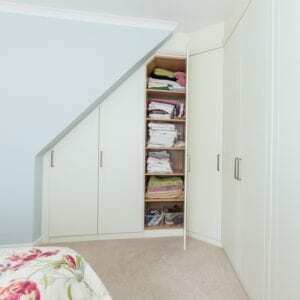 Instead of an ungainly wardrobe being planted in an awkward position, choose fitted wardrobes which will use the space more wisely and even allow your guests some hanging space for their clothing when they visit. Rooms with sloping ceilings and other architectural features like eaves and chimney breasts can make a space seem even more cramped. Whilst you can’t remove these fixtures, you can ensure that you make the most of them from both a style and a practical perspective. 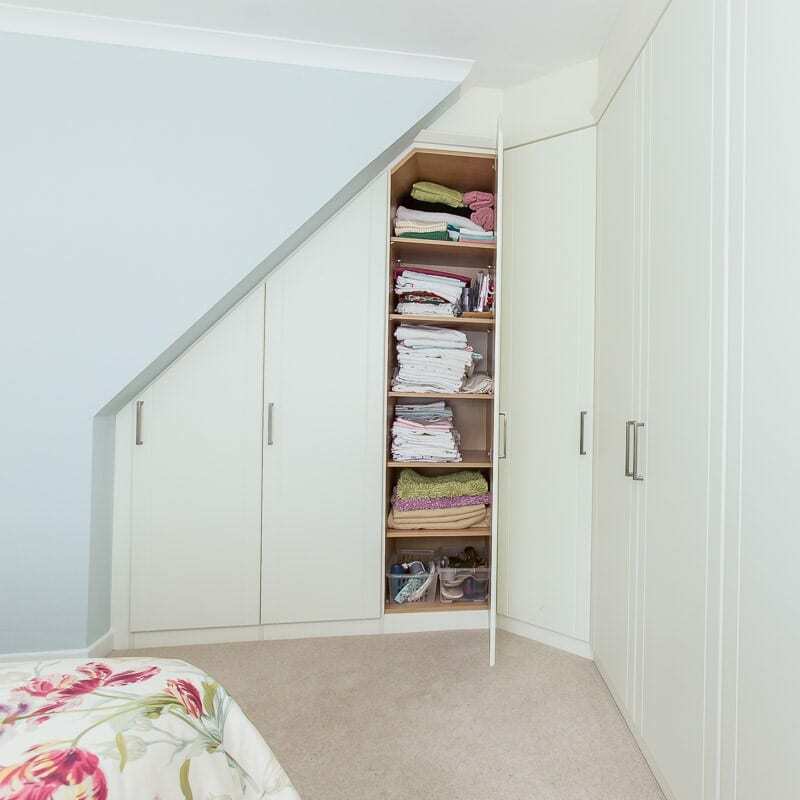 Beams and eaves can be easily figured into a fitted furniture scheme, and uneven walls can have shelves mounted to them to provide extra storage. Working out how to best repurpose your spare room may not come naturally, so it’s useful to have some guidance. Hartleys can assist, providing professional and creative advice on any type of bespoke furniture. Call us on 01756 700471, or take a look at our ranges in-person by visiting our Yorkshire showroom. If you’d like us to pop round and discuss the most effective ways to transform your spare room, you can request a design visit to your home from one of our friendly team.